The data presented below has been prepared in accordance with the Equality Act 2010 (Gender Pay Gap Information) Regulations 2017. The figures are taken from employee data correct as at 5 April 2017. This data includes all permanent employees who have had no leave* in the pay period, and shows the difference between the average hourly rate** of male and female employees. *‘Leave’ refers to maternity, paternity, sick leave and long term disability. **‘Hourly Rate’ is the ordinary/basic pay as described within the Gender Pay Gap Information Regulations. This includes all permanent employees as at 5 April 2017 and show the difference between the bonuses paid to male and female employees. This includes all permanent employees and shows the percentage of male and female employees that were paid a bonus in the relevant pay period. 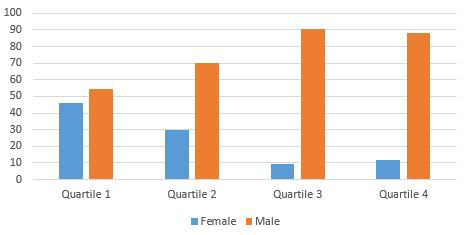 This includes all permanent employees who have had no leave in the relevant pay period, and shows the percentage of male and female employees in each quartile. I confirm the information and data reported is accurate as of the snapshot date 5 April 2017. The data presented below has been prepared in accordance with the Equality Act 2010 (Gender Pay Gap Information) Regulations 2017. The figures are taken from employee data correct as at 5 April 2018. This data includes all full pay relevant employees who have had no leave* in the pay period, and shows the difference between the average hourly rate** of male and female employees. This includes all relevant employees as at 5 April 2018 and show the difference between the bonuses paid to male and female employees. This includes all relevant employees and shows the percentage of male and female employees that were paid a bonus in the relevant pay period. 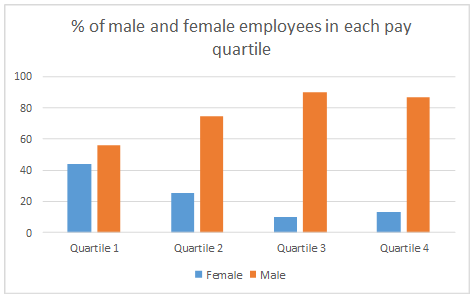 This includes all full pay relevant employees who have had no leave in the relevant pay period, and shows the percentage of male and female employees in each quartile.